In the previous piano lessons we learned about the whole note, the half note and quarter note. A whole note is a note that lasts four beats. We divided the four beats to two groups and each note (which lasted two beats) was called a half note. We did the same with the quarter note and so each note quarter note lasts one count or beat. Today I'd like to show you what happens when we divide a quarter note to two. When we divide a quarter note to two we create two equal eighth notes. 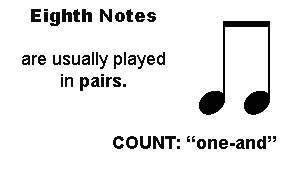 Two eighths are played at the same time of one quarter note. We draw an eight note by filling up the circle in black and adding a one flag to the stem of the note. When eighths are played in pair you'll see that both their stems are connected. You might even see two pairs of eighths connected together. We count "one-and" "two-and" three-and" and so on for each group of two notes in a quarter note In order to be able to play the eighths rhythmically. 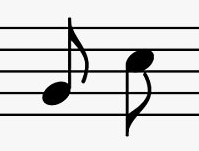 The Eighth Rest means you have to REST FOR THE VALUE of an EIGHTH NOTE. In the rhythmic patterns below you'll see how a single eighth note are used with an eighth rest. Check out these patterns. Try to count and clap along. Here's a handy tip from me. When we count rhythm in a piece we always count according to the highest value of the denominator of the shortest notes in a piece. So let's say that before we start playing a piece we saw that the shortest notes of the pieces have eighths in the denominator. We will start playing the piece while counting eighths the whole time through, even when we have quarter notes or half notes. Why? because when we keep the same counting parameter we make sure that we keep the time accurately. Here's the melody of a musical piece with eighths, Musette by Bach. Let's try to play that one together. Click here if you haven't signed to Piano Playground, our free E-zine yet. Make sure you do that in order to get the username and password codes for the Eighth Note Sheet Music I provide here under. Mussete by Bach Download Your browser does not support the audio tag. Old Macdonald Download Your browser does not support the audio tag. The Four Seasons - Vivaldi Download Your browser does not support the audio tag. Here Comes The Bride Download Your browser does not support the audio tag. Ode to joy from symophny no. 9 by Beethoven Download Your browser does not support the audio tag. Are you sleeping? Download Your browser does not support the audio tag. Yankee doodle Download Your browser does not support the audio tag. The Surprise Symphony by Haydn Download Your browser does not support the audio tag. Minuet in G by Bach Download Your browser does not support the audio tag. Can-Can Offenbach Download Your browser does not support the audio tag. In order to take the next step in reading piano notes you should definitely check out the Rocket Piano Ultimate Learning kit. 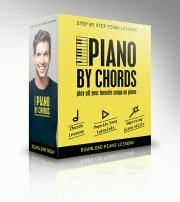 Rocket Piano provides an amazingly handy and effective piano course on various issues such as reading piano notes, playing piano by chords, piano technique and more.